As investors and advisors await final equity crowdfunding rules from the SEC, capital raising options from other JOBS Act-related offerings are gaining steam. The JOBS Act opened up new ways of raising capital. As investors and advisors await final equity crowdfunding rules from the SEC, which are expected by year end, capital raising options opened up by two other JOBS Act-related offerings are gaining steam. The Jumpstart Our Business Startups Act of 2012 not only removed the ban on general solicitation under Rule 506 offerings under Regulation D, but the Act mandated that the SEC adopt final rules to facilitate smaller companies’ access to capital under Regulation A, which the SEC adhered to in March with its expanded Reg A+ rule. The exemption under Reg A+ allows smaller companies to offer and sell up to $50 million of securities in a 12-month period, subject to eligibility, disclosure and reporting requirements. SEC Chairwoman Mary Jo White has stated her goal is to complete the agency’s crowdfunding rule under Title III of the JOBS Act this year, which she has said is the last “significant” JOBS Act rule for the agency to finish. The forthcoming Title III rule is often referred to as “retail crowdfunding” because it will allow nonaccredited investors to invest in offerings of up to $1 million. Some pretty cool things (or dangerous, depending on your point of view) are happening now under Rule 506 Reg D offerings — namely funding for the New York Wheel. 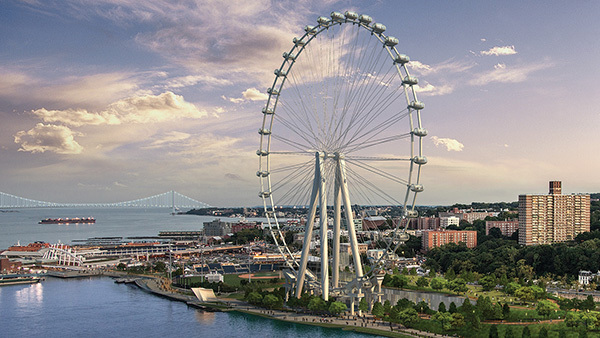 North Capital Private Securities (NCPS), a broker-dealer specializing in private placements, is currently leading a $30 million equity offering through a syndicated crowdfunding offering to provide additional equity financing for the New York Wheel, which closed a $456 million construction financing deal earlier this year. NCPS will be leading the offering on its affiliated 99Funding marketplace platform, which launched last year as the first online platform for broker-vetted syndicated private offerings. What Is the New York Wheel? Scheduled to be finished early in 2017, the 630 foot (about 60 stories) New York Wheel will be situated on the northeastern side of Staten Island in New York, and will be the tallest observation wheel in the world — until the Dubai Eye, which is said to be 690 feet, gets erected in 2017 or 2018. The London Eye stands at 443 feet. The Wheel’s website says it will accommodate up to 1,440 people per ride, welcoming as many as 30,000 visitors per day and an anticipated 4 million-plus visitors per year. Before the opening of general solicitation under Reg D of Rule 506, the typical accredited investor would get involved in nontraditional asset classes or in private investments through “pooled products,” Dowd explained, that “were characterized by high fees, large minimum investments” and were marketed privately. “So the only way to really find out any information about them was if you happened to know the manager or knew someone who did,” Dowd said. Dowd sees NCPS’ securities and investing knowledge as the firm’s competitive “edge” in the private offerings space. The Dodd-Frank Act requires the SEC to review the accredited investor definition every four years. The SEC’s Division of Corporation Finance is currently performing a “deep dive” into the definition, according to White. Dowd questioned whether potential threshold changes to the definition are wise. If the SEC’s proposed guidelines are adopted, income thresholds would be raised to $500,000 for individuals ($700,000 jointly with a spouse), “drastically reducing” the number of qualified households to 3.7 million from the current 8.5 million (7.3% of all households) and shrinking the pool of investment capital, he said. What Is — or Isn’t — Crowdfunding, Anyway?